This is my CRM. I use this when I have conversations with placement officers or consultants about potential students. I take notes, snap a photo with my Evernote app, and tag them with student’s name and the consultant/placement officer’s name. I then log my notes into our database. It’s an extra step, but as I can’t access my database on the road, this works. It’s not perfect, but it’s a work in process. The free month of pro level Evernote is a nice perk—although don’t ask me what it gets you. 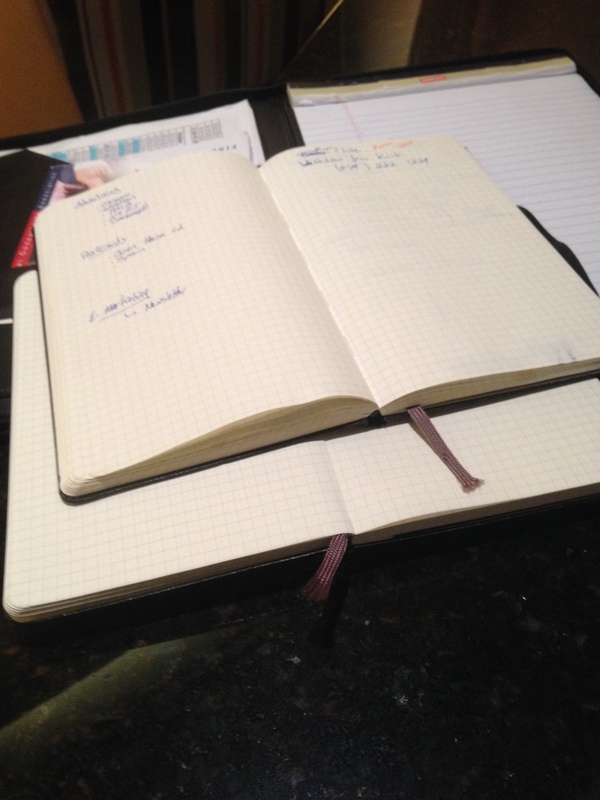 I’m not totally in love with Evernote, but I know people who are. Something about the visual display just doesn’t quite click with me. One pro-feature I do love is the business card scan feature. Scan a business card and it reads it and gives you the option to connect via LinkedIn. I keep an 8×10 notepad by my office phone. This is my scramble pad. It’s the pad I use to write down quick to-do’s or phone numbers when I go through my voice mail. I blow through a couple of these a month. This is a padded leather zipper portfolio that has an 8×10 in it. It was never designed for this, but it’s the perfect carrying case for my Macbook Air. I rarely use this pad, as I typically have my Macbook with me when I have the pad with me. Still, it’s helpful for jotting quick to-do’s. I’m not great about checking it though as I typically just unzip the top third of the zipper and pull out my Macbook without fully opening the portfolio. This isn’t a notebook per se, but it is rather a Google Chrome, iPhone and iPad app that I cannot live without. This is a simple app that connects across multiple platforms. It’s great for simple, one-line, action items like, “Call Mike to discuss next month’s presentation.” I have it open all of the time and if it isn’t on my Do-It-Tomorrow, then chances are it is totally off of my radar. The visual presentation is simple, and rather Moleskine-esq. The coffee mug ring is a nice touch and is basically my life. Like I said, these are systems that work for me relatively well. There is definitely room for improvement, but I think I’ve got a solid foundation here. In truth, I probably have too many active notebooks. At times, it can lead to some confusion, and I can’t say that I have ever felt like I have my organizational issues under control, but my method has worked relatively well for me.